UC Irvine Health is the first medical center in Orange County to offer heart failure patients a wireless system that allows cardiologists to remotely monitor their pulmonary artery pressure and heart rate measurements. Heart failure refers to the progressive weakening of the heart muscle until it no longer pumps enough blood to meet the body’s needs. Advances in treatment allow more patients to survive hospitalization for heart failure, but more than 50 percent of them experience a new onset of symptoms and end up being readmitted within six months. Cardiologists hope the CardioMEMS Heart Failure System will help break this cycle. 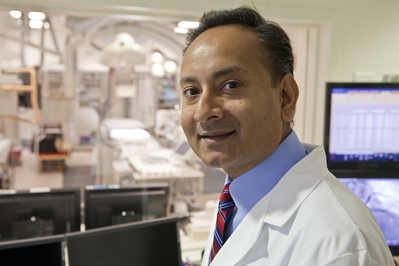 Dr. Pranav Patel, chief of the UC Irvine Health Division of Cardiology, implanted the sensor in an 84-year-old male patient on Feb. 6. The UC Irvine Health Heart Failure Program uses state-of-the-science equipment and technologies to identify the cause of heart failure, or cardiomyopathy. A multidisciplinary team then works with patients to stabilize their condition and develops a comprehensive treatment plan. In each of the last four years, the program has received the American Heart Association’s Get With The Guidelines – Heart Failure Gold Plus Quality Achievement Award. The recognition signifies that UC Irvine Health has achieved the goal of treating heart failure patients according to prevention guidelines recommended by the American Heart Association/American College of Cardiology. UC Irvine Health comprises the clinical, medical education and research enterprises of the University of California, Irvine. Patients can access UC Irvine Health at physician offices throughout Orange County and at its main campus, UC Irvine Medical Center in Orange, Calif., a 412-bed acute care hospital that provides tertiary and quaternary care, ambulatory and specialty medical clinics, behavioral health and rehabilitation. U.S. News & World Report has listed it among America’s Best Hospitals for 14 consecutive years. UC Irvine Medical Center features Orange County’s only National Cancer Institute-designated comprehensive cancer center, high-risk perinatal/neonatal program, Level I trauma center and Level II pediatric trauma center, and is the primary teaching hospital for UC Irvine School of Medicine. UC Irvine Health serves a region of more than 3 million people in Orange County, western Riverside County and southeast Los Angeles County.